After a thorough, professional tooth cleaning, you know that your teeth look brighter and feel fresher. But tooth cleaning isn't just about appearances. It's the primary means of preventing and treating periodontal (gum) disease. Many studies have demonstrated a possible link between periodontal health and overall (systemic) health — which means regular tooth cleaning may benefit not just your mouth, but your whole body. Why do teeth need special cleaning? Over time, dental plaque (a naturally occurring bacterial biofilm) and stains build up on tooth surfaces. Dental calculus (also called tartar), a harder deposit, can then form both above and below the gum line. A thorough dental cleaning removes these substances from the teeth, and helps keep disease-causing bacteria from proliferating. Tooth cleaning is usually accomplished by the non-surgical technique of scaling, sometimes called “root debridement.” It's typically a relatively painless procedure in which small dental instruments are used to physically remove deposits from the surfaces of teeth. At one time, scaling was performed entirely with manual tools. But in the last several decades, the ultrasonic scaler has changed all that. What Is An Ultrasonic Scaler? There are different types of ultrasonic scalers, but all of them work in a similar fashion: electromagnetic forces in the unit's hand-held “wand” cause its tiny tip to vibrate rapidly. These vibrations, which occur at a rate faster than the speed of sound, effectively blast away plaque, calculus and stains from the tooth surfaces. A small stream of water and/or antibacterial mouthwash, which emerges near the tip of the scaler, is called lavage. Lavage is used to cool the ultrasonic scaler's tip and flush away debris from the area being treated. The vibrating tip causes some of the water to break into millions of tiny bubbles, an effect called cavitation. This ruptures the walls of bacterial cells and helps create an environment that's less hospitable to harmful bacteria. Studies show that a thorough ultrasonic cleaning takes about one-third less time as compared to hand scaling — which means you need less time in the chair. Many patients prefer ultrasonics to other types of scaling, possibly because it requires the clinician to use less force than a hand scaler to get the same effect. 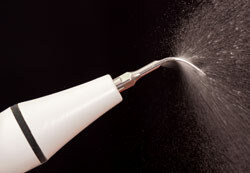 In ultrasonic scaling, only the tip of the tool touches the tooth surface, and only for a short time. It's also possible to remove deposits of plaque and tartar from under the gum line by using an extremely small tip on an ultrasonic unit, which can cause less discomfort and result in a deeper and better cleaning. Sometimes an ultrasonic scaler is used first, and then any stubborn areas are scaled by hand. Anyone who has a substantial buildup of tartar or is prone to gum disease can benefit from ultrasonic scaling. It can also help to remove stains from coffee and cigarettes, for example. Yet, for all its power, most people experience little or no discomfort during the procedure. If you have very sensitive teeth, it may be possible to alleviate some discomfort by using slimmer tips on the scaler. Alternatively, a topical anesthetic may be applied, or conscious sedation can be administered. The power range, the flow of lavage water and the frequency of tip vibration may also be adjusted for increased comfort. Special tips are also available to clean composite or porcelain tooth restorations, titanium implants, or areas of demineralization (enamel loss) on your teeth. If you have a cardiac pacemaker, be sure to alert all dental professionals/personnel before ultrasonic scaling treatment, so precautions can be taken.